Use over-the-top rocket powered parkour and reckless moves to carve your own way through challenging levels. Through a heavy focus on speed and mobility you gain lots of freedom to choose your own resolve, and you are never limited by the controls. But it won’t be a cake walk. Use your reflexes and wits to survive, as you encounter numerous hazards, everything from immense mind bending obstacles to hostile robots standing in your way. All set in a mysterious and hostile dreamscape of floating ruins among the clouds. Carve your own path through every level. It has branching level selection and a catchy soundtrack with a retro feel. Challenge your friends records, and beat their cloud saved ghosts. No unlocking skills. It is all there to explore and master from the get go. The in-house engine utilizes Nvidia PhysX Technology. 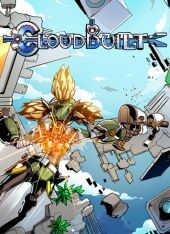 On July 25/2017, Super Cloudbuilt, a remastered edition stays true to the original concept with an emphasis on player skill and creativity, but with even more diverse mechanics and a more connected and varied world. Complete incredible feats of free-running and sharp shooting. Run through expansive worlds floating above a vast abyss, use your rocket-powered exo-suite to explore hidden paths and collect power ups to boost your performance. Try your hand at 177 challenges and experiment with 3 game modes. Features lightning-fast, action-packed speedrunning gameplay: use reflexes and speed to compete for the top position in the leaderboards.